“Baptized in PCBs,” a book by Ellen Spears, won an award for contributing to the history of public health. From the October 2014 edition of Desktop News | A book documenting the link between contamination from a major chemical company and Anniston’s extensive civil rights history recently won an award for contributing to the history of public health. Dr. Ellen Spears, an assistant professor in New College and the Department of American Studies, is the 2014 recipient of the Arthur J. Viseltear prize given by the American Public Health Association’s Medical Care Section. 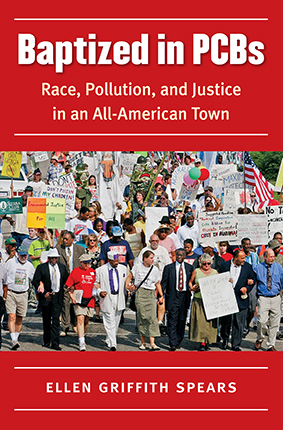 The award recognized Spears’ book, Baptized in PCBs: Race, Pollution, and Justice in an All-American Town. Spears’ book tells the story of chemical company Monsanto being accused of dumping polychlorinated biphenyl, or PCBs, into predominately black and blue-collar neighborhoods in Anniston. “The fact that the burden of environmental harms falls unequally on communities of color and the poor is a systemic problem that must be addressed structurally and comprehensively – through reforming how we regulate toxic chemicals, through addressing the unequal distribution of noxious facilities and waste sites, and through putting in place strong public health measures that yield healthy surroundings for everyone,” Spears said. Spears’ research began decades ago from an interest in questions of inequality, especially environmental inequalities. Spears will receive the award Nov. 15-19 in New Orleans at the annual American Public Health Association meeting. Spears earned her Ph.D. in American Studies at Emory University’s Graduate Institute of the Liberal Arts in 2006. Prior to receiving her doctorate, Spears held leadership roles in several nonprofit groups in Atlanta, including serving more than 10 years at the Southern Regional Council, a civil rights research.